WhatsApp has updated its iOS app to version 2.17.30. The updated app not only brings helpful additions to the app for current users it also hides certain features that might be launched in the future. WhatsApp for iOS version 2.17.30 has the following additions apart from bug fixes that the end users can currently see. The major addition is the creations of albums. Instead of individual photos unnecessarily crowding your messages, the photos are sorted into an album. This only works if you send more than four photos and videos without captions. The photos are automatically put into an album which the receiver can tap on to bring them to full screen. From the full screen they will be able to swipe thorough the media. 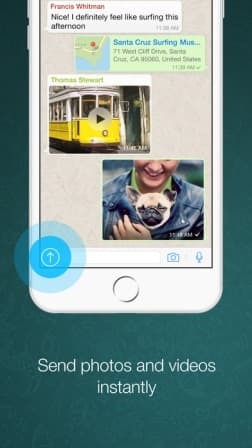 The next major addition to the WhatsApp iOS app is the ability to add filters to your photos, videos and GIFs. The filters are hidden in the camera section and can be invoked by swiping up in the drawing tool view. Currently you have the option of choosing from five filters which include Pop, B&W, Cool, Chroe and Film. WhatsApp says that more filters will be added soon. On the WhatsApp iOS app you may be also able to send quick replies to messages by swiping right on the incoming message. Minor improvements include, Bengali, Gujarati, Irish and Urdu localisations, reporting spam easily, new call icon, a new icon which notifies that the contact isn’t available for calling and a new tone for call end. 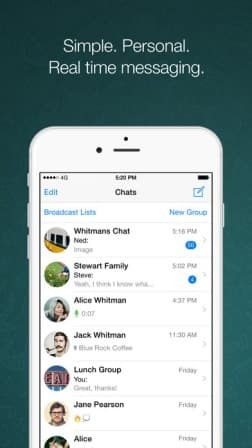 Apart from the features that you can see, WhatsApp has also hidden new features that may make their way to you soon. You see with every new WhatsApp release, the developers hide a features that are enabled from the server when the team at WhatsApp is convinced that the feature works properly. The ability to revoke messages within a 5 minute timeframe has been called as Recall. You might note that feature was earlier called ‘UnSend’. The Contacts section will now be available under the Status section. Statuses can be muted from certain users. WhatsApp has borrowed three sticker packs from its parent company Facebook. Recently sent GIFs and Stickers will be easier to access. Live Location sharing will be accompanied by push names. 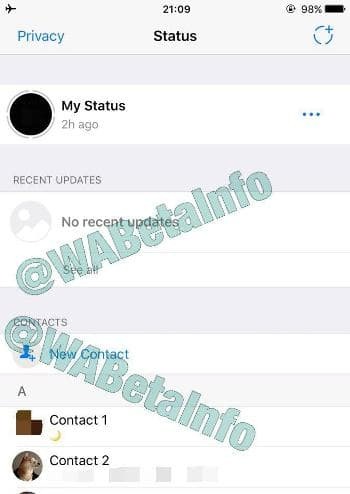 WhatsApp Status can also be sent from WhatsApp Web.